Senior saxophonist McKayla Hess and fifth grader Paige Gehret are pictured during a morning alto sax lesson. VERSAILLES – Band Big Brothers Big Sisters Program is in its fourth year at Versailles High School. This program was created by the high school students on the Band Leadership team to help tutor young musicians in the middle school band program and was made possible thanks to the funding received through the Bocholt Grant. It is student-led again this year by Junior Band Leadership team member Jenna Mangen. There is still time to sign up if a child wants to take lessons after or before school on either Mondays or Tuesdays until March of this year. The leadership program is funded by the Bocholt Foundation. This grant help put the Band Big Brothers and Big Sisters student-led tutoring lessons in place. 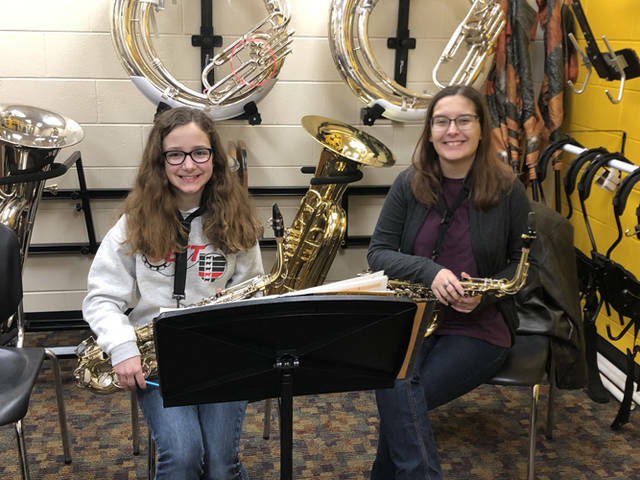 Students who want to learn more about playing an instrument or for those who are struggling to read and perform in band benefit from the guidance of their older peers.